I’ve often thought that pasta salads were a bit underrated, especially on the summer picnic/BBQ scene. With all the fresh veggies available it just seems to scream summer. Not to mention a nice bright vinegar-dressed side seems more obvious to me than a mayo-based one to cut through the savory, often fatty, flavors of grilled meats. I enjoy this salad year round though, as it’s easy, nutritious, and these fresh veggies are almost always available. It can easily be made vegan by leaving out the cheese (though check the label on the salad dressing for hidden dairy). Bulk it up with some leftover rotisserie chicken or serve it alongside the protein of your choice. There’s almost always leftovers and this recipe is even better for lunch the next day! Prepare the pasta according to package instruction. In the meantime, chop your veggies and add them to a large bowl, along with the crumbled feta cheese and sliced olives. When the pasta is cooked, drain and rinse under cold water. Add the cooled, rinsed pasta to the bowl and toss with the veggies, cheese, and 1 cup of the salad dressing to start. Reserve the remaining 1/2 cup of dressing for when you are about to serve. 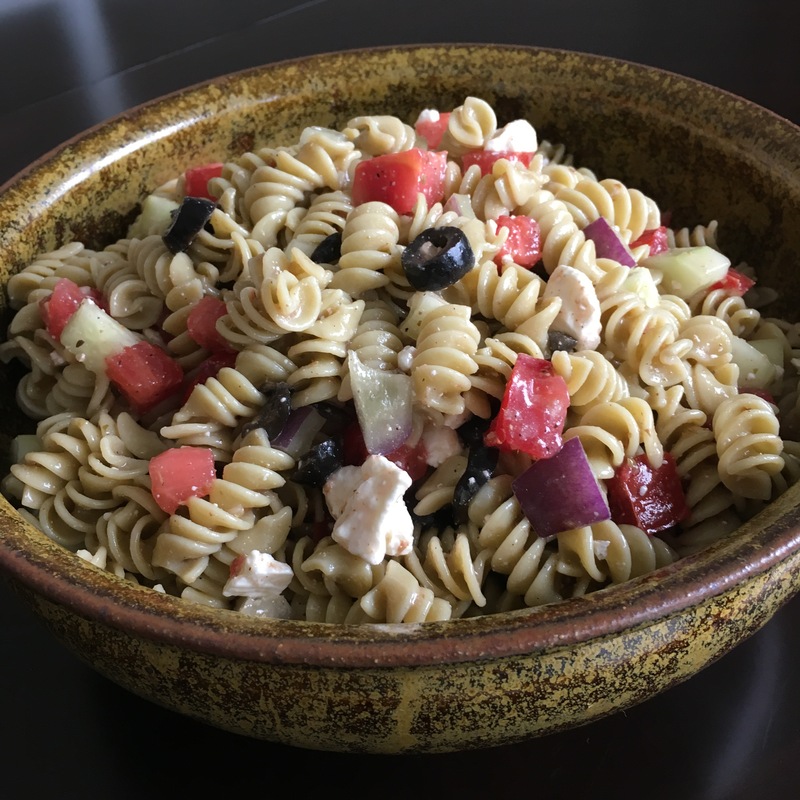 When ready to eat, stir the pasta salad and taste for flavor. Add more of the reserved dressing if the salad is too dry or if it needs more flavor. Most bottles have a good 2 cups, so there should be plenty if you like it saucy.